East Grinstead is an anomaly in West Sussex, for it is a town of the High Weald, close to Ashdown Forest, with timbered or tile-hung old buildings and some of wealden sandstone. It only became part of the county in 1974; previously it was in East Sussex, near where Kent, Surrey and Sussex meet. 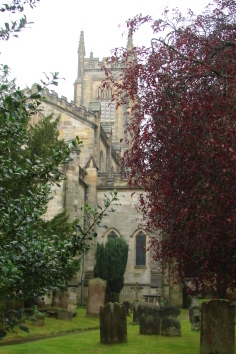 A priest at Brambletye within the hundred is mentioned in Domesday Book (10, 105), but M Leppard concludes that he was not connected with the present parish church of St Swithun, which existed by 1106, though from the dedication it may have had a pre-Conquest origin, when it would have served the whole area (1 p149). The site is near a crossroads on a hilltop, where a main north-south route (the present A22) meets an east-west one (now A264). A town was laid out around the church in the C13, though it was then too far inland to be of major importance. Later, iron was worked in the area and it became a market town; by the C16 it was the seat of the Assizes. Still an important communications centre in the C19, several railways were built (now all but one belonging to the national system have gone). Wealthy Victorian built country retreats in the area, one of which, Standen, now belongs to the National Trust. The town itself expanded, particularly northwards to join the village of Felbridge and parts of the parish of Lingfield across the Surrey border. C20 expansion was more to east and west. 1. M J Leppard: Church Origins at East Grinstead, SAC 142 (2004) pp148-492.